The Result. Thank you and goodnight. Despite all our best efforts, wonderful support from villagers, and some great arguments and reasoning, the Strategic Planning Committee voted 4-2 to approve Jones Homes application for 58 houses at the Town Hall on Thursday. 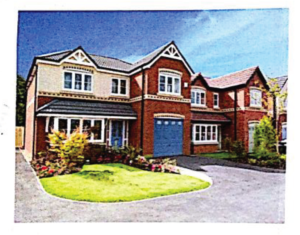 In our opinion Kirklees planning officers have ignored and manipulated information in order to support their building an inappropriate development in an unsuitable location, just to boost housing figures. This despite a recent judgement from the Planning Inspectorate stating that housing land supply was not an overriding factor. The committee is made up of a majority who don’t understand our small rural outpost, and it seems the vote was influenced by this lack of appreciation, and party politics. We believe this is not ‘planning’, it’s simply mass housing rollout to meet spurious targets, irrespective of any other factors. The modification of the junction of Dunford Road and Penistone Road on safety grounds – however the developer cleverly inserted a clause that they get the money refunded after five years if this is not actioned. Due to the ownership of the land in question not being known, it’s quite possible that this will not be started. Construction of all houses should be in natural stone with natural slate roofing. This will need to be carefully monitored as it’s possible that the developer might try and save money by ignoring or bypassing this and other conditions. On behalf of the HEFF committee (or in other words, a group of well-meaning laymen), a big THANK YOU to all those that gave moral and financial support during our sixteen month campaign. We have met some great people and made friendships throughout this trying time, so some good has come of it. We hope you continue to enjoy our meteorologically challenged village and it’s beautiful surroundings. Should you want to view the committee meeting it was webcast live and will soon be ready for retrospective viewing here. You can see the planning application here 2016/60/91967/W . The two planning applications on the Dunford Road land were heard before Kirklees Strategic Planning Committee on Thursday 10th August. Representations were made by Kirklees planning officers, Savills (agent for Jones Homes), Holme Valley Councillors and HEFF. Kirklees planning officers, although admitting that there are many valid reasons (see our arguments) against building so many houses in this remote rural location, are recommending that the application goes ahead. Just as worryingly, they seem to be trying to help the applicant rush through the process. To this end there were incorrect and misleading facts presented to the committee by planning officers and even after 15 months in the making, there was necessary documentation missing that meant the applications should not have been put to committee for a decision. HEFF made five verbal representations, each to a strict three minute timescale, and Holme Valley councillors made representations of 5 minutes. The committee, after a significant amount of debate, decided that a decision on these applications should be deferred until the necessary reports and documentation could be brought. Ding ding, end of round one…..
As judgement day draws nearer we’ve been busy preparing. The HEFF team are planning to make representation, and we would appreciate your support in attending this public meeting. The meeting is at the Council Chamber, Huddersfield Town Hall at 1pm, Thursday 10th August. Kirklees to rule on dual planning applications at Dunford Road. Kirklees have announced the fact that they will be going to planning subcommittee to decide the fate of the fields on 10 August 2017. Judgments on BOTH the planning applications will be made. On the day of the judgement members of the committee will be visiting by bus to view the site – so we urge anyone opposing the development to be aware of this. And the more people that be seen to support us and can attend committee the better. The HEFF committee will be taking all possible action to try and press our case, and will be undertaking media activity and making representations at the meeting. Given the late notice, we were delighted with the attendance level at our meeting at the football club on Sunday 4th June. It’s obvious we have very strong support within the village, and it was gratifying that so many people turned out and pledged their allegiance. The main gist of the meeting was to stress the importance of commenting on BOTH the NEW planning application (ref 2017/91623) and the updates to the old (but still live) application 2016/60/91967/W . Please note HVPC decisions are just recommendations to the Kirklees planning committee, and the decision will rest with them, so we’ll be fighting hard to ensure common sense prevails. We’re also fundraising as we will need all the help we can get (possibly professional) to convince Kirklees that HADE EDGE IS DIFFERENT (as we all know it is!). Please email hadeedge@hadeedge.com if you would like to donate. There will be a village meeting to discuss the status of the planning application on Sunday 4th June 2017. Please download and return the Hade Edge village public consultation document here. Seen a rare breed in Hade Edge? 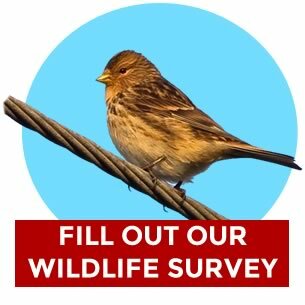 Fill out our Wildlife Log here. Since the last update about the flyer from Savills, we have learned that a detailed application has now been submitted (ref 2017/91623) – this can be found on Kirklees Council’s website by clicking here. There are also rumours that other pieces of land in the same tract have been sold to developers, we are keeping our eyes on this in case another application comes in. The HEFF committee will be going through the new planning application and make some recommendations as to how villagers can make their views known with the dates by which this should be done. Don’t worry too much about the dates currently shown on Kirklees website as these will be amended when site notices go up. We expect that we will restating the same points that were raised last time round as the new application has shown little change with additional comment on the new plans and reports. We remain of the view that development of the scale proposed is still not appropriate or sustainable given the location of the site and the nature of the village. We also know that we continue to be up against it given Kirklees’ situation and track record. However we believe we have a good team and we will nevertheless continue to work hard to oppose the proposals in their current form. In due course we will be calling upon as many people as possible to oppose the application (see above). More advice coming soon. We have also depleted the funds we raised last year and will be looking for your generous donations. Thank you for your support so far and keep tuned in for updates soon. While all this activity is going on, Kirklees Council’s new Local Plan is moving ahead slowly –we have submitted comments and the next key stage is where a Government appointed inspector takes charge of the process and calls an “examination in public” – this is a relatively informal process where comments from invited parties can be discussed with the inspector and the Council and the inspector can decide whether any further changes to the plan should be made. This next stage is not expected to take place until September by which time the new planning application could have been to Committee so that will be our main focus of attention. We are aware that many villagers made comments on the Local Plan so thanks for your contributions. Some (but not all) residents will be aware that there has been a new consultation document and questionnaire from Savills, who are acting on behalf of Jones homes. This is available for download here. Though Kirklees may need more housing (though we doubt that the calculations are valid), Hade Edge is NOT the right place for a development of this type or scale on sustainability grounds. In addition, transport and other infrastructure is inadequate, and a development of this type will swamp the village and change it’s character irreversibly. We think the rest of the questionnaire is designed to elicit answers that can be used to the developers benefit and therefore should be struck through and not answered. It’s your choice if you decide to give them your personal details. There has been activity in recent weeks on various planning issues relating to the land at Dunford Road in our village, here is an update and we’re asking you to submit comments on the Council’s revised Local Plan by Decemeber 19th. As you know the Group is opposing Jones Homes’ planning application for the site. The application has been updated to remove part of the site that is in green belt from the application site. At present we are trying to find out when the planning application will be decided by the Council. We believe there are technical issues regarding the impact of the development on the ecology of the site and wider area which mean that the application should not be determined until further work is done by Jones Homes. The earliest that work can be done is springtime next year. We will provide a further update when we have some more news, until we know what is happening the planning application remains our immediate target. We have previously reported that the Council has issued its revised Local Plan which sets out Kirklees’ ideas for the next 15 years. The latest version of the Plan now proposes that the application site (as amended), is allocated for housing development (previously it was recommended to be ‘safeguarded’. This has obviously come as a major disappointment to us, we had no notice that this change was going to be proposed so we are now fighting on two fronts – the application, and the Plan. All Local Authorities are required to have an up to date Local Plan in place, Kirklees Council is well behind schedule as a previous draft plan was withdrawn and the Council chose to start again. The Local Plan contains relevant planning policy for its area and allocates land for uses which it considers to be appropriate – this, along with national planning policy and any other relevant considerations, provides the framework for determining planning applications. Kirklees has recently issued its revised draft Local Plan for comment – responses are requested by December 19th. After the consultation the Council will decide whether any further changes need to be made, then the plan will be submitted to the Secretary of State who will appoint an Inspector to conduct an independent examination of the plan. The examination gives interested parties the opportunity to discuss their concerns, but only if representations are made by the deadline of December 19th. The Inspector can ask the Council to make further changes before the plan can be adopted and put in place. The key issues that will be of concern to the Inspector will be to decide if the Kirklees plan is legally compliant and technically sound – we think there are failings on both. We are asking you to help us make Kirklees think again about changing the allocation – which will add weight to the opposition to the planning application. In brief we believe that the Council’s plan is not legally compliant as all the relevant surveys and assessments that are legally required have not been carried out before making a decision to allocate the land for development- for example ecology surveys and landscape assessments. We also think that the allocation of the site is not technically sound. A requirement of national planning guidance is that development should be sustainable and we do not think that Hade Edge is a sustainable location for development of the scale proposed. The Council has carried out a sustainability appraisal of settlements within the district – Hade Edge comes bottom in the ranking of access to essential services, employment, shops and suchlike. However, we believe there are serious flaws in the information the Council has used in this assessment. We do not believe that the assessment adequately takes into account the village’s poor accessibility by public transport, by cycle and on foot to key services and facilities, or the remote location and steep hills which hinder access to services.. We therefore believe that the allocation of the site for housing development is not sound as we believe there are flaws in the sustainability assessment, which if corrected would show that the village and the land at Dunford Road are not in a sustainable location. We would urge all readers to send in comments to the Council. We would suggest that any comments say that the Plan is not legally compliant and not technically sound, we have set out above why we believe this is the case but feel free to use your own examples and put the comments in your own words. We think it is important that comments are made in order to persuade Officers to change their minds. If the Council will not reverse its decision to allocate the site for development before the Plan is submitted to the Secretary of State then we will set out our concerns to the Inspector at the independent Examination that will probably be held in Summer 2017. Register as a consultee, log in, and and comment via the standard form which is accessed from the Kirklees Planning Portal. We suggest that the parts of the Local Plan which are relevant for comments are the Council’s Allocations and Designations report and the Sustainability Appraisal. The site reference for the land in the village is H288a, and you should mention this specifically in your comments. You’ll need to be logged in on the planning portal to access the links in this text. This is not too straightforward, but there’s a help document here which outlines how to do this. Alternatively comments can be emailed to local.development@kirklees.gov.uk . Don’t forget to mention the site reference H288a. If anyone needs any help in making comments please contact us by emailing hadeedge@hadeedge.com or speak to any of us on the Group. We will be making our own comments as a group with the benefit of professional advice in due course. As of 9am this morning, the latest version of the Kirklees Draft Local Plan is available for people to comment on. In this version, which has been approved by councillors, the land covered by the Jones Homes application is recommended to be allocated for building. The window for comments ends on 19th December. It’s our job, as individuals and as a committee, to put the arguments forward to demonstrate that Hade Edge is the wrong place to put 66 and more homes – it’s unsustainable, illogical, and immoral, when so much brownfield sites are available. We also contest that the legal requirements with regard to biodiversity are being sidestepped; we intend to fight this. So what’s happening and what should you do? Members of the HEFF committee have a meeting with the policy officer (this was planned previously but he gave back-word) on the 21st and we intend to do another update then, advising on what we think are the best arguments to put forward. We’ll also be planning a press release and getting a photo shoot together where we’d like as many residents as possible involved. Stay tuned! From the outside looking in, it may seem to have gone fairly quiet on the Dunford Road Jones Homes front. We can assure you though that there has been plenty going on. We’ve had a meeting with Kirklees planning department, and made further representations to the Parish Council, who remain very supportive about our argument regarding the scale and type of the development. There have also been many other discussions with local and regional groups and councillors. You may be aware that while this has been going on, there has been a revised Local Development Plan put forward by Kirklees, in which the land on the planning application is now recommended as a development site. This flies in the face of Kirklees’ own recommendations before and seems, if you’re of a cynical nature, to be very ‘convenient’. This was done in a way that would get minimum opposition, it could have almost been described as underhand on the part of Kirklees planners, and was voted through by council. So now we have two things to fight. The application first, and then the Plan designation. We think we have a strong legal case to say that the council/applicant haven’t undertaken the necessary legal surveys they need to with a site that is this close to the Peak District National Park. We aim to fight this in the first instance. We will be then pushing to get the recommended allocation changed in the Local Plan. We will be needing you to support us in trying to change the allocation when the public consultation period starts in November. We’ll be in touch…. It has come to our attention in the last couple of days that Kirklees officers have been working on changes to the draft local plan and they are NOW recommending that the plot at Hade Edge be released for building land in the next Local Plan. It looks to us like they are doing this because they are currently under pressure from the developer rather than a reflection of a true re-assessment of the viability of the land. All our arguments still stand – the site was listed as 52nd most sustainable site – out of 53 sites! 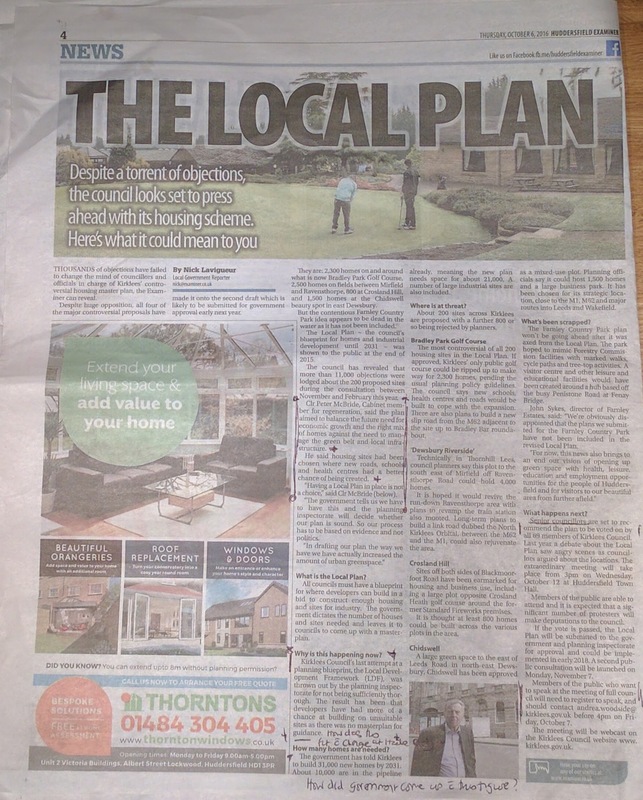 This does not on the face of it affect the current application, as the plan would still be draft – but it’s easy for Kirklees to make the assumption that if it is seen as available in the next local plan, the argument against development could be seen as weakened. This was only published on Wednesday, and they are only giving people a few days to process the information and object to this change. There is an ‘Extraordinary’ council meeting next Wednesday 12th October where YOU can make representation but you need to register by emailing andrea.woodside@kirklees.gov.uk before 4pm TODAY. We were unable to find references to Thursday’s Examiner article online but here’s a picture of the article. Fundraising by cheque has been happening for the past few weeks – thanks to all that have donated. Just a reminder that time’s running out for objection letters to be in to Kirklees. The deadline is a little vague and has changed on a couple of occasions, but we’re advising people that all objections are in for 7th September. If you need a hint of what we think are the best tips for objecting, please click here. Hade Edge residents, Council members and Jason McCartney MP came together at a public meeting in the village clubhouse last night to unite against the proposed development of a new housing estate in the heart of the village. An outline planning application for the development of 66 new houses and a convenience store on Dunford Road was submitted to Kirklees Council by property developer Jones Homes in early August. Residents attending last nights’ meeting were clear that this is only the tip of the iceberg as far as they’re concerned – it’s apparent from the applications supporting documentation that, if approved, Jones Homes intend to develop up to 180 new houses in total, effectively doubling the size of the existing village. 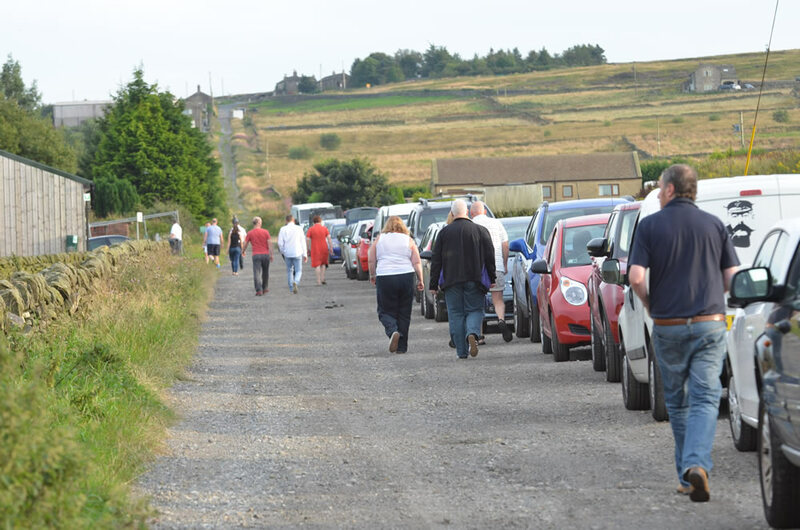 Hade Edge residents last night slammed the planned development as ‘unsustainable, excessive and opportunistic’ in terms of its impact on the existing village, and vowed to fight the application through legal channels, as well as submitting mass individual objections to the council. Members of the Holme Valley Parish Council confirmed that they have voted unanimously to oppose the development. 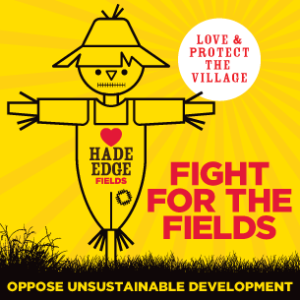 A member of the ‘Hade Edge Fight For The Fields’ community action group told The Huddersfield Examiner, “It is clear that the Holme Valley South is under siege from opportunistic national property developers who have no stake in our communities or countryside. Hade Edge is the latest village to be targeted in a drive to maximise new ‘roof count’ despite the devastating impact on environment and infrastructure. As villagers, we’re not opposed to measured local development, but the overwhelming feeling here tonight is that what’s being proposed is excessive in scale, disproportionately increasing the size of the village – it’s unsustainable. 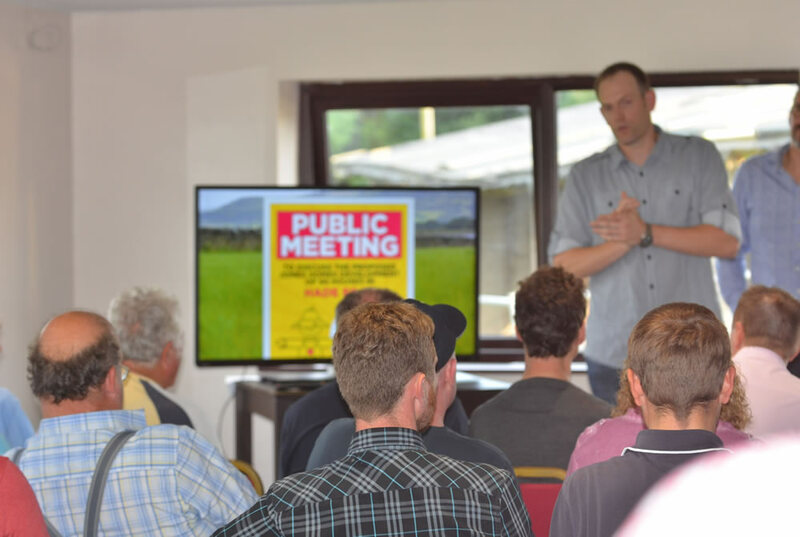 This can only have a negative impact on Hade Edge, so our meeting tonight is a show of solidarity in opposition to this proposal – we will fight together to protect our fields”. MP Jason McCartney added “This is exactly the kind of battle I’ve been involved in in our valley for the last few years, and I will work with and support the Hade Edge action group all the way on this. As in many other area across our region, either where development has already taken place or where there are new planning applications, the infrastructure just isn’t in place for wholesale mass development – it’s totally inappropriate. There are numerous sites better suited to development than here. We must fight to protect the beauty of our villages and to keep them special”.